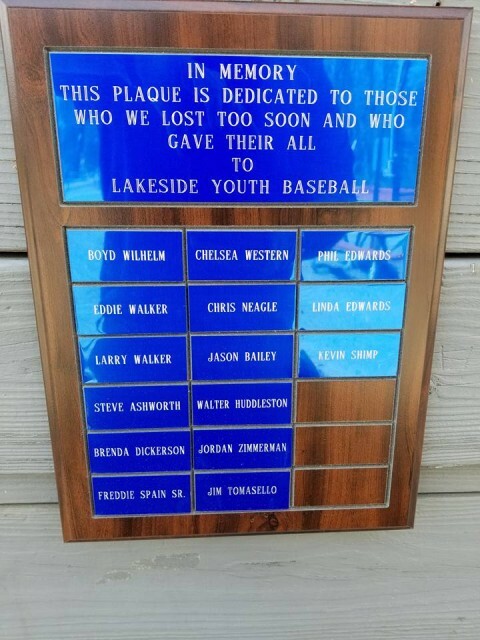 Lakeside is a family league that treasures those that have played, served, and have forever become part of the Lakeside Family. There are several memorials on site that could not have been possible without generous support of our members, former members, and community at large. Materials (stone, bench, home plate, stepping stones, decorative rock, top soil, mulch, and plants) were donated by, or purchased with donations from: Cisneros Roofing, Champion Awards, Koontz Paint and Body, Marshall Lawn & Landscape, Pete Rose Inc., and a number of individual donors. We thank you for your love and support of Lakeside Youth Baseball!